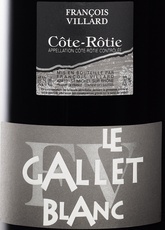 Wine Domaine Francois Villard Cote Rotie le Gallet Blanc 2016 - Royal Wine Merchants - Happy to Offer! 100% Syrah 94 Points Vinous "Opaque, bright-rimmed ruby. An exotically perfumed bouquet evokes black raspberry and boysenberry, incense, candied violet and smoky minerals. Intense, palate-staining black and blue fruit and floral pastille flavors are complicated by exotic spice and mineral notes that become stronger with air. Closes on a youthfully tannic note, showing outstanding delineation, impressive persistence and sweet dark berry notes that hang on tenaciously.” — Josh Raynolds Former chef turned cult winemaker, Francois Villard is a dynamic vigneron making wines of power and grace with great aging potential. His cellars are situated in Saint-Michel-sur-Rhone in France’s northern Rhone Valley. When Villard began to pursue his dream of making wines in the late 1980s, he befriended Yves Cuilleron and worked with him prior to purchasing his own vineyards and releasing his first wine in 1991. Grapes from these steep terroirs must always be hand harvested. A lover of wines from Burgundy and the Loire Valley, Villard aims for finesse, minerality and overall balance in his wines.